Pixar transformed ants into an oppressed class of cute and cuddly bugs. However, in reality, ants are neither cute nor cuddly. And, from the human perspective, ants are the oppressors, not the oppressed. Just ask any homeowner currently experiencing an ant invasion. Although you may be tempted to use ant spray because it stops ants dead in their tracks, I would recommend using ant baits instead. The problem with ant spray is that it only kills the small minority of visible ants. The survivors then have to search for a different access point into your home. Next time, you may not be so lucky. The ant trail may not be detectable so all you will see is small battalions of ants inside without an obvious trail outside. The better solution then is to control the ants using ant baits. 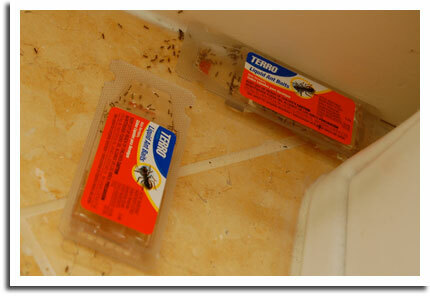 The promise behind ant baits is that the ants will take the poison back to the nest and wipe out the entire colony. I was at the local hardware store this morning looking for some more ant control answers. I had previously set out some Grant’s Ant Stakes , but the ants weren’t biting. I’m not sure why, but the ants just ignored it. After a week, I was ready to try something new. So, I picked up a package of Terro Liquid Ant Baits as well a pack of Raid Ant Baits. Yes, time to escalate. I wasn’t about to try out a new product for another week, only to return back to the hardware store in frustration. So, I opened up a buffet line. Terro in one corner and Raid in another. Within an hour, the ants were swarming all over the Terro ant bait, so much so that I opened another ant bait so that the hungry masses would not have to wait in line. And, after seeing both stations packed, I opened another. Then, it dawned on me. The key ingredient for ant baits isn’t the poison, it’s the lure. If ants walk past the bait without taking a nibble, then it doesn’t matter what active ingredient is contained within the product. So, short of polling the ants, the best bet is to buy a variety of products and let the ants decide. If they favor one product over another, give them all they want. Don’t put out ant bait sequentially or else you might be two to three weeks into an infestation before you figure out what works or not.